Paediatric multiple sclerosis (MS) represents a particular MS subgroup with unique diagnostic challenges. Due to the narrow window of environmental exposures and clinical disease expression, children with MS may represent an important study population for gaining a better understanding of the pathogenesis of the disease. The International Paediatric MS Study Group (IPMSSG) was formulated to clarify the diagnostic and therapeutic dilemmas in this population. This guideline was adapted from the International Paediatric Multiple Sclerosis Study Group guideline and endorsed by PANDA, South Africa. Paediatric multiple sclerosis (MS) represents a particular MS subgroup with unique diagnostic challenges. Due to the narrow window of environmental exposures and clinical disease expression, children with MS may represent an important study population for gaining a better understanding of the pathogenesis of the disease. The International Paediatric MS Study Group (IPMSSG) was formulated to clarify the diagnostic and therapeutic dilemmas in this population. An estimated 2 - 5% of patients with MS have onset of symptoms of MS before 16 years of age. [2,3] Similar to adult studies, a female preponderance is reported for MS in adolescence. [4,5] However, there is no gender predilection in children presenting with MS under 13 years of age. • The combination of an abnormal cerebrospinal fluid (CSF) (presence of oligoclonal bands (OCBs) or an elevated immunoglobulin (Ig) G index) and 2 lesions on the magnetic resonance imaging (MRI), of which 1 must be in the brain, can also meet dissemination in space (DIS) criteria. • The MRI can meet the DIS criteria if it shows 3 of the following 4 criteria: >9 white matter lesions or 1 gadolinium (Gd)-enhancing lesion; >3 periventricular lesions; 1 juxtacortical lesion, and an infratentorial lesion. • MRI can be used to satisfy criteria for dissemination in time (DIT) following the initial clinical event, presence of stable and active lesions on the same scan. • A second non-acute disseminated encephalomyelitis (ADEM) event in a patient is insufficient to make the diagnosis of paediatric MS if the first event meets the criteria for ADEM. MS can only be diagnosed if there is further evidence of DIT on the MRI (new T2 lesions >3 months since the second event) or a new clinical event (>3 months since the second event). • Neuro-imaging. Some children lack typical MRI findings of MS and have either large tumefactive lesions with perilesional oedema or deep grey matter involvement. Basal ganglia affectation in MS, though described, is uncommon. Younger children with MS may also have more diffuse, bilateral ill-defined lesions. The IPMSSG strongly recommends additional imaging of the entire spinal cord to identify other sites of demyelination. The cervical spinal cord is the most common region involved in MS.
• Other investigations. CSF studies should include cell count, protein, cytospin, lactate, and pyruvate ratio and OCBs. The diagnosis of MS requires the exclusion of other possible causes of white matter disease. The complete differential diagnosis is vast and dependent on the clinical presentation and specific imaging characteristics, e.g. 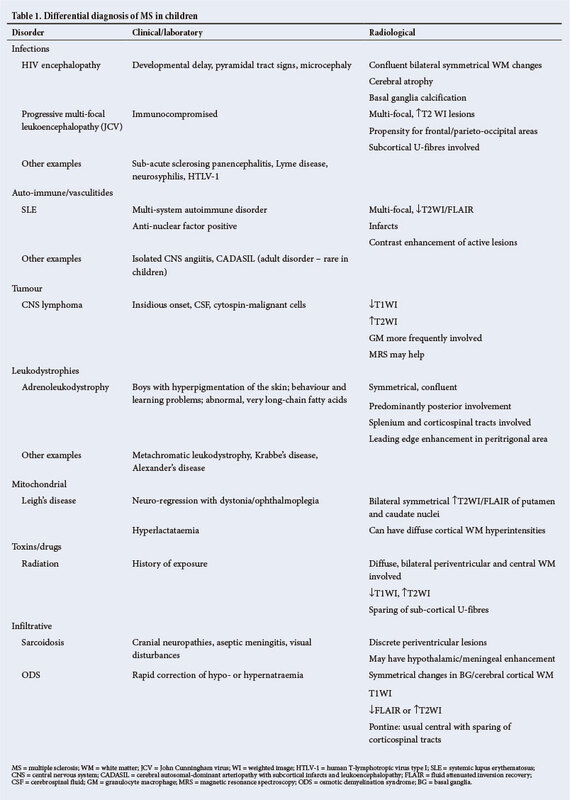 acute encephalopathy following hyponatraemia, with a pontine lesion would suggest pontine myelinolysis (refer to Table 1). Predicting the risk of a first episode of demyelination progressing to MS is important as new immunomodulating therapies become available. Early initiation of disease-modifying therapy (DMT) reduces the risk of relapse and long-term disability. Patients with ADEM progressing to MS vary from 0% to 29%. Multiple historical, clinical, laboratory and radiological criteria are used to predict the risk of recurrence/progression to MS. A seasonal pattern, a history of a precipitant, seizures, bilateral optic neuritis and encephalopathy are considered more likely in ADEM compared with MS. Inflammatory markers, a high CSF protein and leukocytosis are also more common in ADEM. The KIDMUS study identified optic neuritis in patients >10 years of age at presentation and well-defined periventricular or sub-cortical lesions as predictive factors for a second attack. MRI characteristics that are predictive of evolution to MS include: well-defined lesions that are periaqueductal or perpendicular to the corpus callosum, deep grey matter involvement and lesions that enhance post-contrast. MS is a chronic condition with significant impact on all aspects of the family's life. Most drug trials of MS therapies excluded patients <18 years of age as the drugs are not licensed for use in this age group. The longterm effects of these treatments on growth and puberty are also unknown. Management should be transdisciplinary involving psychologists, physiotherapists, occupational therapists and school teachers. There are no therapeutic trials for treatment of relapses in the paediatric population. Management is extrapolated from the adult MS population. The mainstay of managing relapses is high-dose corticosteroids. Relapses associated with significant morbidity warrant high-dose corticosteroid therapy. High-dose IV corticosteroids (10 - 30 mg/kg/day) for 3 - 5 days is usually used with an optional oral tapering dose. High-dose oral steroids were found to be efficacious in adults. Long-term steroid use in children is associated with growth impairment. These therapies are known to alter the disease course and outcomes in adult MS. They reduce the frequency and severity of relapses. [23-25] The IPMSSG recommends the initiation of DMT for children with relapsing remitting disease (defined clinically or by MRI). More than 1 exacerbation in a 1 - 2-year period and new hyperintense T2 lesions of Gd-enhancing lesions on repeat imaging over the same time period also warrants DMT. First-line agents include interferon (IFN)-beta-1b, IFN-beta-1a and glatiramer acetate (GA) (Table 2). Retrospective data on the use of this agent show a short-term safety profile. The dosage used varied from 4 to 8 MIU subcutaneous (SC) injection. The dose regimen also varied from every alternate day to 3 times-weekly injections to once-weekly doses. The standard adult dose of IFN-beta-1a of 30 µg once per week by intramuscular (IM) injection has been used effectively in older children, but half the dose is often used for very young children (<3 years of age). IFN-beta-1a SC injection has also been successfully administered to paediatric MS patients. Patients tolerated this drug well and reported only minor side-effects. Limited data are available on the use of GA in children 9 - 16 years of age at a dose of 20 mg daily. Available data report no serious adverse events. Case reports of second-line therapies used include azathioprine, natalizumab, cyclophosphamide and mitoxantrone. Patients should be followed up to monitor safety, tolerability and efficacy. The IPMSSG recommends monthly full blood counts and liver function tests after initiation of DMT until the full dose is reached, and thereafter 3-monthly monitoring. To assess for efficacy repeat clinical assessments at 1, 3 and 6 months, followed by 6-monthly intervals, is recommended. Follow-up MRI should be performed 6 - 12 months after the initiation of DMT. After the first year of therapy in stable patients MRI scans should be obtained annually. Treatment options in patients who demonstrate progressive disease on first-line agents include addition of monthly-pulsed methylprednisone or switching to an alternate agent such as mitoxantrone or cyclophosphamide. A primary progressive course is less common in children than adults. Patients with childhood-onset MS also take longer to reach the stage of severe disability but reach irreversible neurological disability at a younger age compared with patients with adult-onset disease. More severe disease was noted in girls - when the time between the first and second attacks was <1 year - for childhood-onset MS fulfilling MRI diagnostic criteria at onset, for an absence of severe mental state changes at onset, and for a progressive course. In addition to the motor and sensory deficits, cognitive and emotional sequelae are also well documented. Behaviour problems are thought to occur in up to 50% of the paediatric MS population and include depression, anxiety, oppositional defiance, and poor attention and concentration. These may manifest as risk-taking behaviour, substance abuse, school failure and family dysfunction. These problems may necessitate referral to a psychologist, social worker, or child psychiatrist and involvement of the school. Children with cognitive and/or physical deficits may need to be placed in special schools that can cater for their needs.